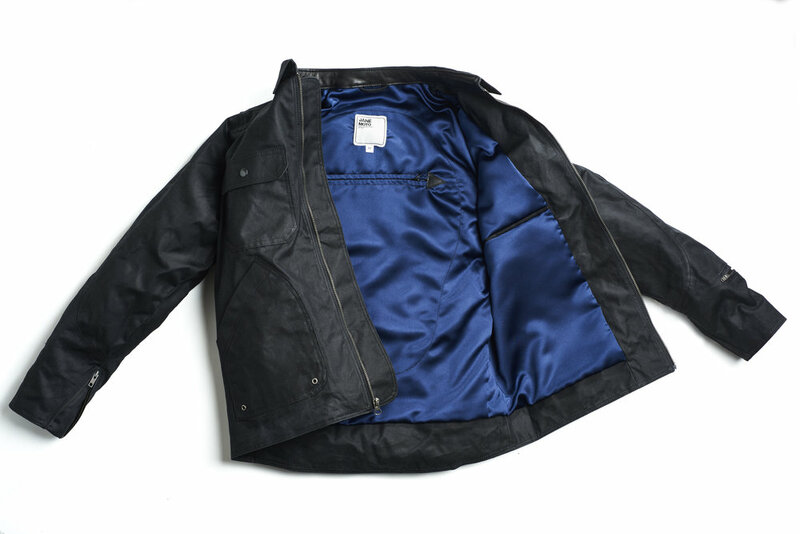 The Driggs Jacket by JANE is designed as a universal jacket. Our life involves being on a bike everyday and we needed a jacket that we could wear on and off the bike. The cut and construction are designed for the motorcyclist but lend itself to everyday use. The Driggs is a riding jacket, and is built for it. The fabric is a water resistant, 8.5 ounce waxed canvas, light enough to be worn in the summer months, durable enough to withstand an accident. All the seams are reinforced with a double stitch nylon thread. The interior is a plush navy blue satin with lamb skin lining the collar and exterior pocket flaps. The jacket accepts d3o armor for the elbow, shoulder and back. All pockets are easily accessible allowing you to quickly go from the bike to street. The design is simple and clean. The fit is slim, meant to be worn with a t-shirt in summer with enough room for layering. The back has gussets allowing for full movement. There are 4 exterior pocket and 1 interior pocket.